Certified Interpretive Guide, Carl Fabre, who is also a member of the National Association for Interpretation and a sixth generation Texan will be leading this Saturday’s tour of Enchanted Rock sponsored by The Friends of Enchanted Rock. Learn about geological landforms, flora and fauna, archaeology and cultural history. Please leave a message at 685-3038 to reserve a spot. The tour will be from 9 – 11 am. Enchanted Rock was designated a National Natural Landmark in 1970 and was placed on the National Register of Historic Places in 1984. The Rock is a huge, pink granite exfoliation dome, that rises 425 feet above ground, 1825 feet above sea level, and covers 640 acres. 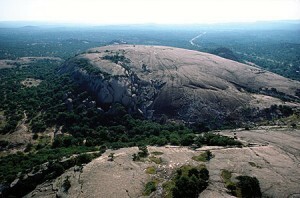 It is one of the largest batholiths (underground rock formation uncovered by erosion) in the United States.